The following is another reprint of a post written by Chris Rodda on Talk to Action, republished here with permission of the author. During his first post-Restoring Honor rally show on Monday, Glenn Beck demonstrated the "contempt" of HuffPost by showing his audience some of the photos included in a HuffPost slide show titled Glenn Beck's Restoring Honor Rally: The Most Ridiculous Messages, which showed some of the messages on the clothing and buttons worn by rally attendees. Beck, of course, in showing how "contemptible" HuffPost is, didn't show the slide show photos of the people in their "Got Tea?" and other Tea Party t-shirts, or the "Give me Liber-TEA," "I Love My Gun," and "Obama's Worst Nightmare" buttons. After all, Beck had insisted that this was not going to be a Tea Party rally, and had asked the attendees to leave their Tea Party and anti-Obama signs at home. And, following the instructions of their leader, they did. They just displayed their Tea Party messages on their persons instead. So, Beck carefully selected a few photos of people merely looking suitably patriotic in their red, white, and blue and rally-themed "Restoring Honor" attire, and then questioned how anyone could possibly think these people were ridiculous. But the photo that caught my attention was one of the back of someone's t-shirt, which Beck showed twice, saying, "This is a quote from George Washington -- ridiculous." 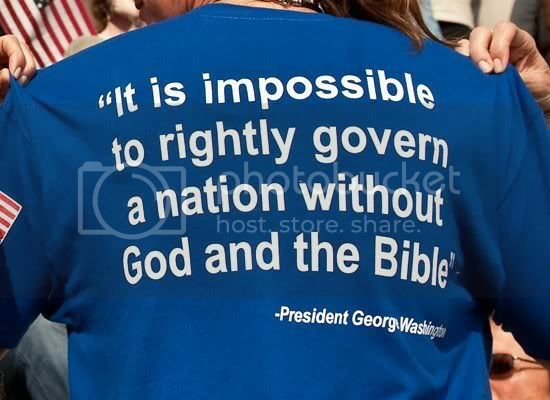 Well, Mr. Beck, I would never call a quote from George Washington ridiculous, but I will call the one on that t-shirt what it is -- a fake! Your new pal David Barton should be able to tell you all about that, since even he himself tells his followers not to use this quote. Of course, good old David didn't say anything when John Hagee used this same fake quote on your show a while back, although he was also one of your guests that day, and sitting only a few feet from Hagee. So, you might just want to go to your pal David's own website, where he has his list of "Unconfirmed Quotations" -- a list of quotes that he himself tells his website readers to "refrain from using ... until such time that an original primary source may be found." This George Washington quote is #2 on the list. I'm so glad you got permission to do this over here. I want to see those people who commented wildly on that other topic a few days ago come over to this one now and try to debunk it!! Wanna take bets on how many comments will be on this one?? LOL!